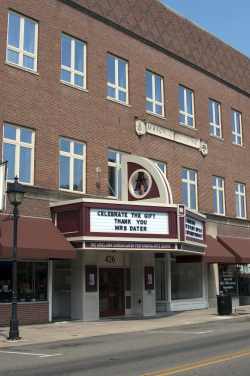 The Ariel-Ann Carson Dater Performing Arts Centre is located at 426 Second Avenue (State Rt. 7) , on the west side of the road one block north of Gallipolis City Park. Our lovely marquee is brightly lit on performance nights so you’ll be sure to find us. On-street parking is available, as well as ample parking around the beautiful Gallipolis City Park, a short block to the south. Stage doors are located in the rear of our facility, accessible by an alley which can be entered from State St. or Third Ave.